Hello! In this article I would like to give you all the best self-defense tips to avoid from getting stolen your smartphone or tablet. The first thing I would like to say you is: be always aware of what happening around you! Why this? Because when you are on your smartphone to check your email, FaceBook news, watch Youtube videos… you are focus only on the screen so you don’t pay attention to people come close to you and things happen around you. If you want to be with your smartphone I suggest you to find a wall and lean on it: so you have to pay attention only at people that come from both your sides and from the front because your back is in a safe solution. The way you grab your smartphone: non only with two fingers but 4 fingers and the thumb and use the second hand on the screen. Don’t use your smartphone only with a hand! In this position it is in a open way to be getting stolen. So grab it very strong with a hand and use the other one. The way you grab your phone in the last point is very useful when someone comes to steal it because you bring back the hand with the phone while you block his arm with your opposite forearm (like a 360° defense), then you can kick with a hummer fist using your phone as a weapon! You can also finish with a kick on the groin and escape. Or you can block his arm and kick on the groin immediately, then call the police and control him on the ground using your tibia on his forearm. If your opponent grab your wrist before you block his arm you can use the move we call “what time is it?” plus bring your elbow close to his one. Moreover if your opponent pull you he gives you a great help to release your wrist! And then you can continue hitting his throat wit your opposite forearm or drop him down. don’t use your smartphone in a public space but if you have to use it always be aware about what happen around you. Put yourself in a place where there are no surprise behind you. Grab your phone as a weapon and use it with two hands. If anyone comes to take your phone: block his hand with your opposite arm, use your phone as a weapon and finish with a kick to the groin. 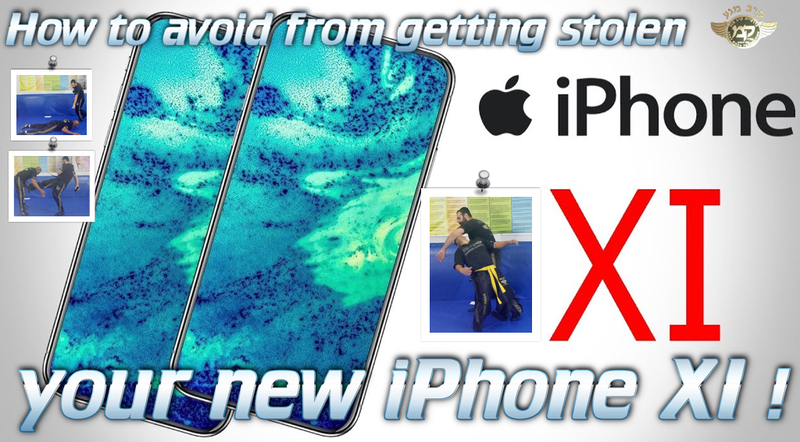 If he grabs the phone and you resist, most of the time your opponent will have the “stupid reaction” to grab the phone also with his second hand: in this case for you is very good because you can hit him with any problems!!! So hit him and hit him!